Arrowwood NWR is part of a complex that includes three fee-title refuges, six easement refuges and three Wetland Management Districts in nine counties of East Central North Dakota. 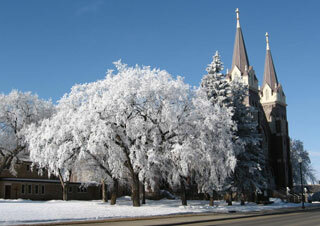 We are located on the wide open prairies of North Dakota. We have no mountains and few trees to obstruct our views! To some it may seem boring. It must be an acquired taste since we think it is great. While we are a low populated state, it is here you will find some of the friendliest people found anywhere. Maybe one learns to appreciate others more when there are not so many to choose from (or weed through like a gardener might say)! As the State Tourism Department says, and we concur, North Dakota Legendary! www.dakotasungardenswinery.com Our winery is centrally located near Carrington, ND. We are approximately 50 miles north of Jamestown, and 50 miles south of Devils Lake, ND. In the winter of 2009-2019, we began work on our winery and tasting room. We included a handicap accessible bathroom, work area and wine storage room. We are available to make reservations or answer questions at 701-674-3623. CrossRoads Golf Club is located north of Carrington, ND on Hwy 281. This 18-hole golf course is a challenging grass greens facility. The medium-length layout should reward good shots and provide a fun golf outing for everyone. It features 5,847 yards of golf from the longest tees for a par of 72. The course rating is 72.6 and it has a slope rating of 121. Designed by James Swart, the Club opened in 2003. The Club has receive the Golf Digest Four Star Award for nine consecutive years and has also been voted as one of the top 450 courses in the country by the same publication. The area also features a scenic 5-mile recreational trail for walking, jogging, bike riding and cross country skiing which connects into the city all the way up to the Carrington Area Park. The White Buffalo is held sacred by American Indian tradition. The White Buffalo Calf Woman Legend speaks of the history of an important peace pipe for the Lakota Nation. This 26-foot-tall, 60-ton concrete giant has been standing watch over Jamestown from the Frontier Village since 1959. Created by sculptor Elmer Petersen, he has proven one of the midwest's most popular roadside attractions for over 50 years. 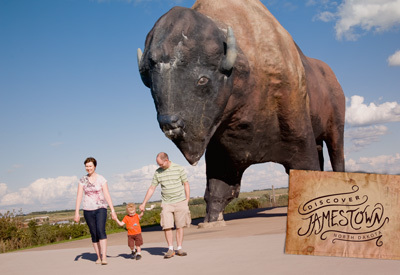 In 2010, the World's Largest Buffalo received his name, Dakota Thunder. Original buildings from the frontier villages of North Dakota have been moved to this site and filled with antiques and artifacts that bring the world of the prairie pioneers to life. Journey through the history and the significance of the bison (American buffalo) with the interpretive panels, artifacts and original artwork on display. The highlight of their exhibits is the herd of live bison that roam the land next to the museum. This herd includes the only certified true albino bison in the world, White Cloud. 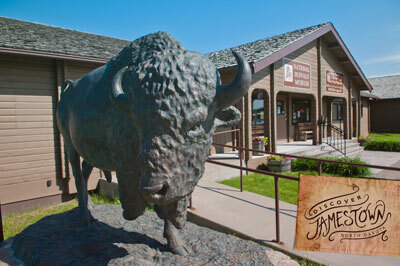 The Prairie Winds Gift Shop, located in the museum, highlights locally-made and buffalo-themed souvenirs. No admission fee is necessary to go into the gift shop. 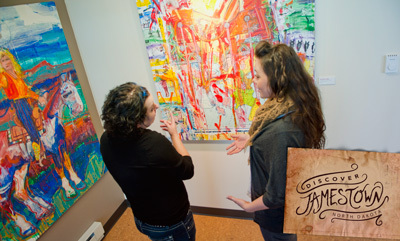 The Arts Center gallery features artists of local, regional and national import. The exhibit changes many times throughout the year. The Arts Center also hosts a variety of theater and musical performances throughout the year; Visit our event calendar to see upcoming events.Recurring events include the Artful Happy Hour (21+), Classic Movie Night, and the Photography Interest Group, just to name a few. They also offer a variety of classes for kids and adults. Printmaking, sculpture, stained glass, dance, theater, and many other arts disciplines are explored. Visit The Arts Center website for details and registration information. Fort Seward was in operation from 1872 to 1877. The well-kept grounds feature and interpretive center, the largest United States flag on display in North Dakota (weather permitting), a Veterans' Memorial Wall, and a beautiful overlook for the City of Jamestown. This huge Arts and Crafts-style mansion showcases design for the early 1900s. Each room features a variety of artifacts from hand-built models of actual Jamestown buildings, to instruments, to guns, to a library with a wealth of information and so much more. Come see the stained glass, the claim shanty, the post office and railroad room. New to the Museum, a replica of the bandstand railroad gazebo has been built on site. This gazebo was originally located in the NP Railroad Park in downtown Jamestown. The gazebo will be dedicated on May 17th, 2014 at 1:00 PM! It sounds like a wonderful celebration. North Dakota has produced great names in sports including Roger Maris, the home run king, and basketball coaching legend Phil Jackson. Housed in the Jamestown Civic Center, this site features photographs and signed memorabilia. This stunning American Gothic-style church was erected between 1910-1914. It has been designated a basilica by the Holy See because of its antiquity, dignity and historical significance. Guided tours are available by appointment.